Our St Mark James CPR and AED provider in Toronto is the largest, most dependable, and least expensive provider in the region. Toronto First Aid has been teaching St Mark James CPR programs since 2007 and has rapidly grown to be the leading first aid and cardiopulmonary resuscitation (CPR) provider. 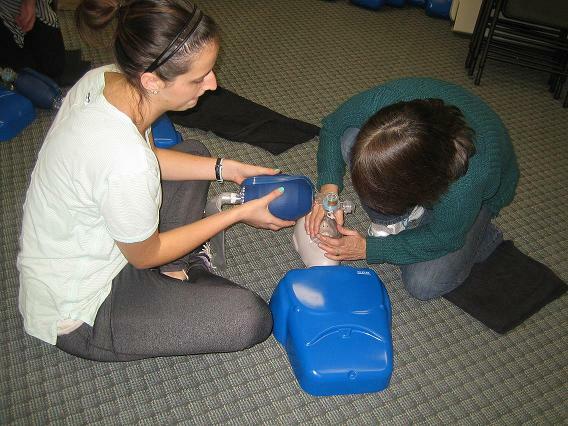 Trainees can enrol in a wide selection of programs including basic first aid and CPR training courses. Training courses are offered in 3 levels: “A”, “C”, and “HCP”. Trainees who successfully complete these training courses will receive a certification for first aid, CPR, and AED use, valid for 3 years. Toronto First Aid also offers refresher courses for trainees who want to renew expiring or near-expiry certification. For registration and additional information click here. Enrolment can also be done through e-mail, telephone, or walk-ins at the Toronto First Aid training centers. Telephone numbers and addresses are available on the website, along with complete class schedules. CPR Level “A” which offers basic CPR and AED training for adult and child victims, CPR Level “C” which offers basic CPR and AED training for adult, child, and infant victims, along with basic first aid, and CPR Level “HCP” which offers comprehensive CPR and AED training for health-care providers. All three levels are inclusive of basic first aid and AED training. Up-to-date guidelines are use during the instructional classes for CPR. Watch the video below to get an idea of what will be undertaken in Toronto First Aid training courses for CPR. Trainees can enrol in a wide range of first aid classes, including pet first aid. First aid training for common emergency situations, from cuts and scrapes to sprains and fractures. First aid classes will introduce you to the J-thrusts for choking victims and variations of it, among others. The video shows a short demo of what to do when an individual is choking, which will be covered in basic first aid training. Refresher courses or courses for renewal of expiring or near-expiry certificates are offered by Toronto First Aid. Successful completion of any training course will give trainees a certificate for first aid, CPR, and AED use, valid for three years. This provider is the cheapest service provider in Toronto. No other training service provider offers more affordable prices. Rates are inclusive of certification, taxes, and St Mark James registration fees. The training centers are clean, neat and well-maintained and provide the latest training equipment. Toronto First Aid is certainly devoted to offering the best teaching services. Toronto First Aid is dedicated to providing the greatest number of programs with a wide variety of classes. Refresher / re-certification courses are provided at least two times every week. Toronto First Aid understands the need for numerous available classes. Toronto First Aid offers customers convenient and comfortable registration. Applicants can sign up for a course by contacting the staff via electronic mail or telephone. Prospective trainees can also enroll for programs via on-line application forms. All class dates and times, locations, and costs can be found on the Toronto First Aid website. Toronto First Aid has the very best course instructors in the region. They’re professional, friendly, patient, and highly competent. The shoulder and the knee are the most common areas of dislocated ball and socked joints in adults and teenagers. The elbow is the most common in children. Dislocation is very painful and causes swelling. If you get any of these areas dislocated, seek medical help immediately. Stabilize the joint. You can splint the area to keep the area immobilized. DON’T force the joint back into place if you are not a trained health care provider. Put ice on the injured joint to control swelling, pain, and build up of fluid in the area. Bring victim to the nearest emergency room. Enrol at Toronto First Aid today!